Description: NS train Q35's DPU. It's unusual to see an ACe on a Scherer coal drag. It's even more unusual to see one as the DPU. I like the "brutish" look of the ACe. A good candidate for a Transformer robot maybe? Description: These 2 would later handle the empty that the WEs brought down. Description: CSX N954-01 heads east on the CSX Garrett Sub at Saint Joe, IN. Title: Over and Under at Walsh Jct. Description: MCHAS 18 ducks under BNSF 9292 the DPU of E RTRCKM0 58A. 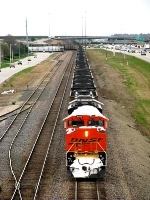 Title: BNSF 9292 leads a loaded coal sb. Title: BNSF 9292 leads a empty coal back north for the mines. Title: BNSF 9292 Leads a Empty coal Nb. Description: Bnsf 9292 Is seen heading Nb toward Hannibal mo about to meet A coal load At Hannibal. Description: Eastbound coal empties climb Providence Hill on the Lakeside sub. Description: Southbound empty Roberts Bank coal train on the Bellingham sub. 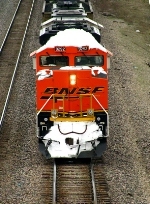 Description: At BNSF's Dayton Yard. Title: BNSF 9292 leads a empty coal train up the K Line. Description: Empty coal train rips into Old Monroe Mo. Description: For an instant, westbound BNSF #9292 is framed by the signals that protect the CN/EJE turnout in downtown Girffith, IN. Description: BNSF #9292 crosses Broad Street in downtown Griffith, IN, on its westward run. Description: Waiting for first train to get underway. Description: Crappy low light shot of a Eastbound coal train rolling over the UP at Grand.